We apologize for the unavailability. Estimated availability is 22.5.2019. We can send you email when we get goods in stock. It crunches between your teeth. Crunches. Colours. Tastes Great. Helps. 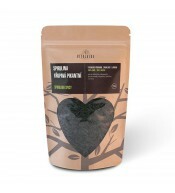 More than a year has already passed since we added spirulina to our offer. 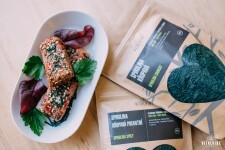 A farm we are importing our Spirulina from is selling it in a unique sun-dried form. 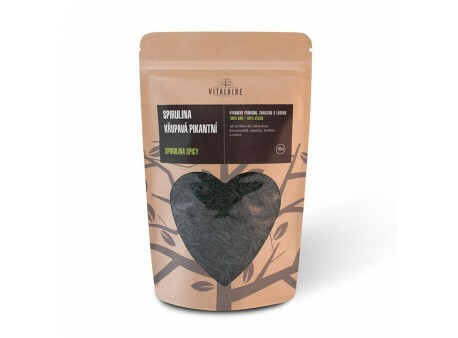 You won’t find any other crunchy Spirulina product in the Czech Republic. 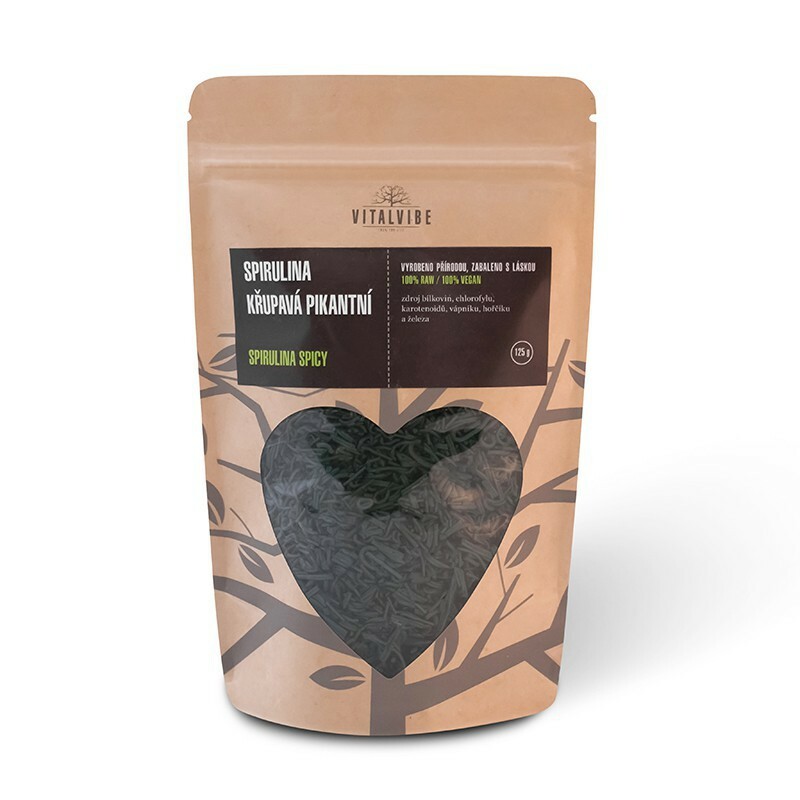 Spirulina has 65% protein content, a large range of vitamins, minerals and many other micronutrients, while maintaining a high absorbance. Its Life on a Farm. A story of Spirulina begins in an organic farm in a region of Auroville, situated on the coast of South India. A specific sunny climate allows a singular way of production of a high-quality Spirulina by using methods of organic farming. Spirulina is cultivated in shallow ponds in about 15 cm depth, its water is supplemented with nutrients (minerals and salt), which are forming optimal life conditions for this alga. A pond culture is mixed various times per day, so a process of photosynthesis was stimulated. Spirulina, collected from water in the form of biomass, undergoes cleaning and filtration process. Then comes pressing, until it gets a paste form, which is consequently grounded to “spaghetti”. Those are dried on the sunshine, which takes just couple of hours in a local maritime climate. If you want a spicy taste algae, masala and chilli must be added before drying (Spirulina Crunchy Spicy). Finally, Spirulina is broken into smaller pieces and packed. A Place of Origin Story. Our Spirulina originates from an interesting place permeated with spiritual tradition. Auroville is an experimental township whose mission is mainly to promote human spiritual development and harmonic lifestyle. A large range of ecological technologies and alternative methods is applied there. Also, a producer of Spirulina follows ethical values. This farm with more than twenty years tradition is based on practices beyond compliance in long-term sustainability and Fair-Trade principals. It employs mainly women from socially disadvantaged local communities. It looks after favourable and safe working conditions and a good salary for the employees. Our Spirulina Crunchy, whose original native homeland is the Huacachina lake in Peru, comes from Spirulina Paracas culture. It presents one of first forms of life (around 3,6 mil. years ago) and it was used as a food source for Mexican and African culture. It’s interesting primarily for its crunchy form and great taste, obtaining directly on the farm. We have it in our offer for two reasons: it’s tastier than its powder form and our co-owner Honza felt in love with at first taste. 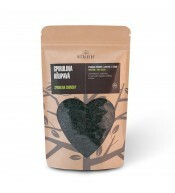 Spirulina is used in salads, salty food or as a simple snack. How It Could Help Me? 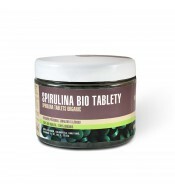 Spirulina supports blood circulation owing to its iron, chlorophyll and vitamin B contents. Thanks to a complex amino acid profile and an abundance of vitamins, minerals and other phytonutrients, it helps to nourish and regenerate organism completely. It reduces hunger and a sweet tooth. It lets you enjoy “veggies” in your diet easily every day. Kids who don’t fancy veggies. Teenagers and mums, both in need of nutrients. Active sportsmen focusing on an intake of good quality micronutrients. Modern people who are busy but who care about a good quality nutrition. Patients who want to get well fast. High Percentage of Protein: almost 60% of spirulina weigh is formed by proteins; those contribute to a good health of bones and a feeling of fullness, they help during growth and development of a body. 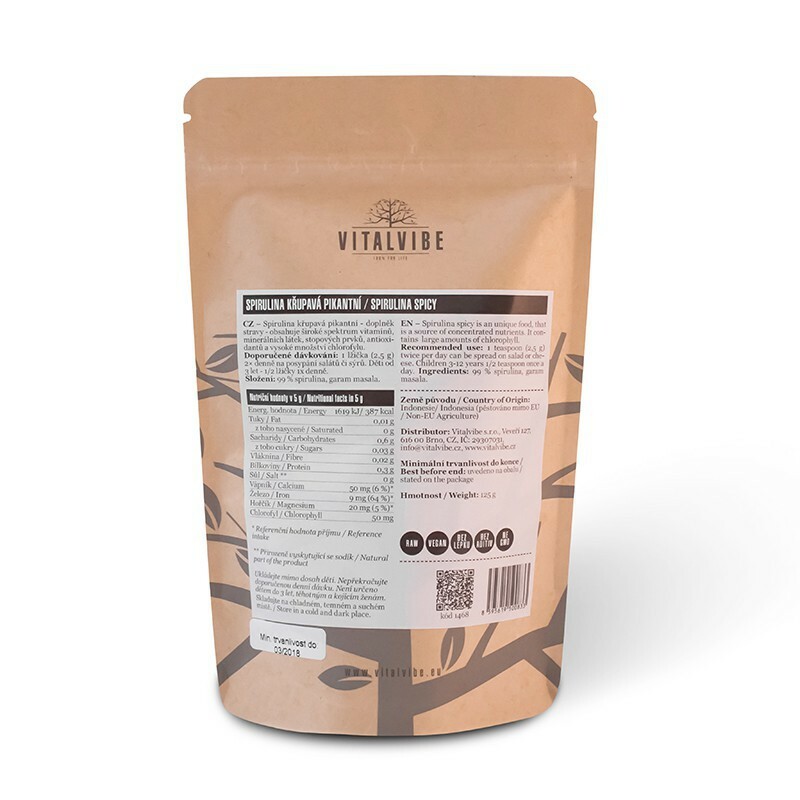 Amino Acids: It helps to regenerate, contributes to a balanced production of hormones and enzymes, contributes to a healthy blood circulation, a health of heart and livers, it supports sexuality. A large spectrum of vitamins and minerals: A high content of calcium contribute to healthy and strong bones, iron support haematopoiesis and magnesium is important for your muscles and nerves, support a sugar transport and contributes on energy production. A large spectrum of vitamin B (B1, B2, B3, B6, B12): a positive impact on a good function of nervous system. Potassium: Important for a good heart function. Vitamin E: Contributes to a good function of your immune system and increases body resistance, activates energetic metabolism, increases the efficacy of vitamin C and has antioxidant effects. Chlorophyll: A positive impact on haematopoiesis. Beta carotene: A predecessor of a vitamin A, a natural antioxidant, absorbs free radicals from UV light, it is good for healthy eyes and clear vision. Gamma Linolenic Acid (GLA): A good function of cell walls, cardiovascular system and immunity, antioxidant effects. Ingredients: 100% spirulina, garam masala (coriander, cumin, cardamon, cloves, chili, tumeric, cinnamom, bay leaves). Do you feel like having a snack? 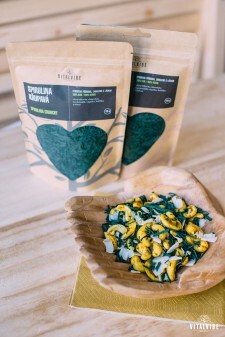 Let’s make our spicy oriental mixture with cashew nuts and spicy spirulina from Bali.